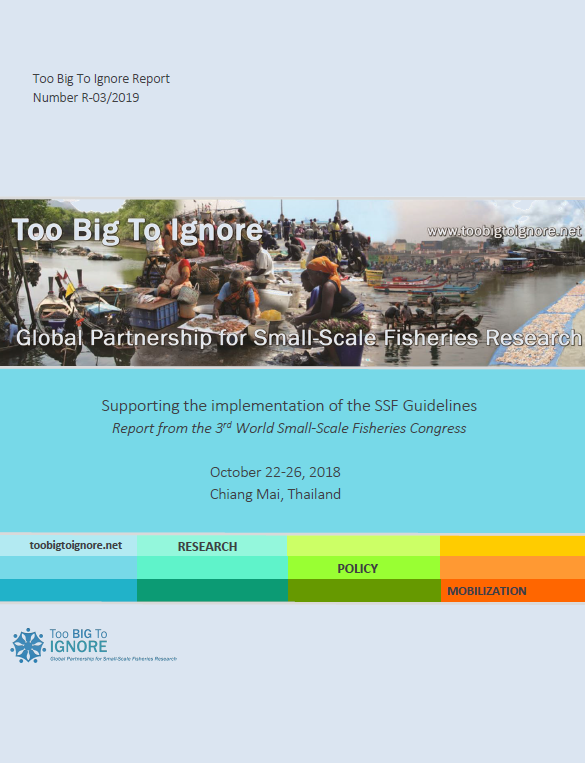 The 3rd World Small-Scale Fisheries Congress (3WSFC), held in Chiang Mai Thailand in October 2018, was an opportunity for researchers, practitioners, fisher organizations, CSOs, and policy makers to share up-to-date information about all aspects of small-scale fisheries and to formulate action plans and capacity development programs to support the implementation of the Voluntary Guidelines for Securing Sustainable Small-Scale Fisheries in the Context of Food Security and Poverty Eradication (SSF Guidelines). This report presents the summary of the discussion about the SSF Guidelines, outlining in particular the roles of governments, CSOs, and research community in the implementation process, and illustrating some of the main challenges and opportunities in the implementation. In addition, the report provides insights on what kind of governance transformation is needed for a successful implementation as well as how best to integrate knowledge and foster communications to enhance this process. From a practical standpoint, the report provides direct examples of how the SSF Guidelines are being implemented in five countries across the globe. e) direct contribution from early career scientists and developing country participants throughout the congress. The full report from is available below.